Muhammad Abu Mansur al-Maturidi (853–944 AD) (Persian: محمد بن محمد بن محمود أبو منصور ماتریدی سمرقندی حنفی‎‎) was a scholar of Islamic jurisprudence and Qur'anic exegesis. Al Maturidi is one of the pioneers of Islamic Jurisprudence scholars and his two works are considered to be authoritative on the subject. He had a "high standing" among the scholars of his time and region. He was born in Maturid near Samarkand, (possibly) in 853. He was educated in Islamic theology, Qur'anic exegesis, and Islamic jurisprudence. The area of Samarkand was at his time under the Samanid and its urban population were predominantly Tajik while the surrounding steppes was largely populated by Turkic-speaking people. His Teachers were Abu Nasr Ahmed b. Abbas b. Husayin al-Iyazi, Abu Bakr Ahmed b. Ishak b. Salih el-Juzjani (writer from Al-Farq wat Tamyiz),Nusayr b. Yahya al-Balkhi and Qadilqudat Muhammad b. Mukatil ar-Razi. Abu Nasr al-Iyazi was his teacher and friend. Abu Bakr al-Juzjani was the pupil of Abu Sulayman Musa b. Sulayman el-Juzjani, who was the pupil of Imam Abu Yusuf and Imam Muhammad Ash-Shaybani. Muhammad b. Mukatil did learn from Imam Muhammad as-Shaybani too. When al-Maturidi was growing up there was an emerging reaction against some schools within Islam, notably Mu'tazilis, Qarmati, and Shi'a. The Sunni scholars were following Abu Hanifa. Al-Maturidi, with other two preeminent scholars, wrote especially on the creed of Islam and elaborated Abu Hanifa's doctrine, the other two being Abu al-Hasan al-Ash'ari in Iraq, and Ahmad ibn Muhammad al-Tahawi in Egypt. While Al-Ash'ari and Al-Tahawi were Sunni together with Al-Maturidi, they constructed their own theologies diverging slightly from Abu Hanifa's school. Al-Ash'ari, enunciated that God creates the individual's power (qudra), will, and the actual act giving way to a fatalist school of theology, which was later put in a consolidated form by Al Ghazali. Al Maturidi, followed in Abu Hanifa's footsteps, and presented the "notion that God was the creator of man’s acts, although man possessed his own capacity and will to act". Al Maturidi and Al-Ash'ari also separated from each other in the issue of the attributes of God, as well as some other minor issues. Later, with the impact of Persianate states such as Great Seljuq Empire and Ottoman Empire, Hanafi-Maturidi school spread to greater areas where the Hanafi school of law is prevalent, such as Afghanistan, Central Asia, South Asia, Balkan, Russia, China, Caucasus and Turkey. Maturidi had immense knowledge of dualist beliefs (Sanawiyya) and of other old Persian religions. His "Kitäb al-tawhld" in this way has become a primary source for modern researchers with its rich materials about Iranian Manicheanism (Mâniyya), a group of Brahmans (Barähima), and some controversial personalities such as Ibn al-Rawandi, Abu Isa al-Warraq, and Muhammad b. Shabib. Radd Wa'id al-Fussaq, a refutation of the Mu'tazili doctrine that all grave sinners will be eternally in hell fire. ↑ Katip Çelebi. (1943). Keşfü'z-Zünûn an Esâmi'l-Kütüb vel-Fünûn, (Vol. I), (pp. 110‑11). Istanbul: Maarif Matbaası. ↑ Ali, A. (1963). Maturidism. In Sharif, M. M. (Ed. ), A history of Muslim philosophy: With short accounts of other disciplines and the modern renaissance in the Muslim lands (Vol. 1), (p. 261). Wiesbaden: Otto Harrassowitz. ↑ Pessagno, J. M. (1984). The uses of evil in Maturidian thought. Studia Islamica, 60. p. 59. ↑ Feener, R. Michael; Khalid, Adeeb (2004). "Islam in contemporary Central Asia". Islam in World Cultures: Comparative Perspectives. ABC-CLIO. p. 135. ISBN 9781576075166. Retrieved 2012-12-22. Central Asia has long been an integral part of the Muslim world. Arab armies conquered the cities of Transoxiana in the early eighth century, turning the region into the frontier of the Muslim world. 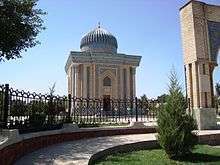 Over the next two centuries, the urban population, mostly Tajiks converted to Islam, and the cities very soon became connected to the networks of Muslim culture and of Islami learning.... This position was cemented by the emergence, at the end of the tenth century, of Bukhara as the seat of the independent Samanid Persian dynasty, which patronized the development of "new Persian" (e.g. Persian as fully Islamized language) as a literary language. The surrendering steppe, with its largely Turkic-speaking population, remained a borderland. ↑ Williams, J. A. (1994). The word of Islam. London: Thames and Hudson. p. 145. ↑ Ali, A. (1963). Maturidism. In Sharif, p. 260. Wiesbaden: Otto Harrassowitz. ↑ Ali, A. (1963). Maturidism. In Sharif, p. 259. Wiesbaden: Otto Harrassowitz. ↑ Gimaret, D. (1980). The´ories de L’Acte Humain en The´ologie Musulmane. Paris: J. Vrin. ↑ Hye, M. A. (1963). Ash'arism. In Sharif, p. 226. Wiesbaden: Otto Harrassowitz. ↑ Shah, M. (2006). Later Developments. In Meri, J. W. (Ed. ),Medieval Islamic civilization: an encyclopedia, (Vol. 1), (p. 640). New York:Routledge. ↑ Lucas, S. C.(2006). Sunni Theological Schools. In Meri, J. W. (Ed. ),Medieval Islamic civilization: an encyclopedia, (Vol. 1), (p. 809). New York:Routledge. ↑ See G. Vajda, "Le Témoignage d'al-Maturidi sur la doctrine des manichéens, des daysanites et des rnarcionites", Arabica, 13 (1966), pp. 1-38; Guy Mannot, "Matoridi et le manichéisme", Melanges de l'Institut Dominicain d'Etudes Orientales de Caire, 13 (1977), pp. 39-66; Sarah Stroumsa, "The Barahima in Early Kalam", Jarusalem Studies In Arable and Islam, 6 (1985), pp. 229-241; Josef van Ess, "al-Farabi and Ibn al-Rewandi", Hamdard Islamicus, 3/4 (Winter 1980), pp. 3-15; J. Meric Pessagno, "The Reconstruction of the Thought of Muhammad Ibn Shabib", Journal of American Oriental Society, 104/3 (1984), pp. 445-453. Correa, Dale. "Testifying Beyond Experience: Theories of Akhbar and the Boundaries of Community in Transoxanian Islamic Thought, 10th-12th Centuries CE." 2014, Middle Eastern and Islamic Studies, New York University. Dorroll, Philip C. ″Modern by Tradition: Abū Manṣūr al-Māturīdī and the New Turkish Theology." 2013, Graduate Division of Religion, the Laney Graduate School, Emory University, Atlanta, GA.